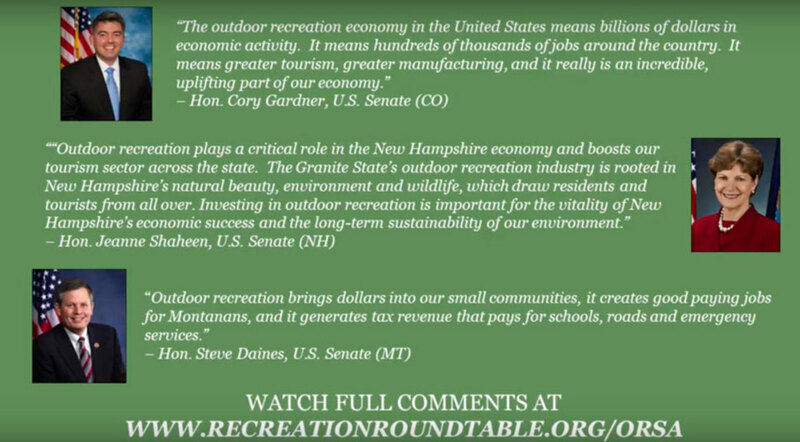 The Outdoor Recreation Roundtable released a video last week showing highlights of the first-ever report on the outdoor industry’s economic impact. Commerce Secretary Wilbur Ross described the outdoor recreation industry as one of the nation’s largest and fastest growing, calling the industry statistics “phenomenal,” according to ORR. Outdoor recreation in the United States generated $412 billion in revenue in 2016, and provides $734 billion in annual gross economic output, comprising 2.2 percent of the nation’s GDP, said Ross in the video. “Those are very, very big numbers,” Ross said. People think of outdoor recreation as “just fun,” said National Marine Manufacturers Association president Thom Dammrich. “But those of us in the outdoor recreation industry knew there was a different story to tell,” Dammrich said. The Outdoor Recreation Roundtable is asking Congress to include $1.5 million in funding in fiscal year 2019 to allow the Outdoor Recreation Satellite Account to develop data at the state level.